This book goes chapter by chapter through Luke giving you the various threads that connect the parts. Unlike his Historical Reliability of the Gospel of John, this book doesn’t run through the Gospels chapter by chapter. This book tackles the textual issues people have brought up against the gospels as a whole. Blomberg spends some time explaining various forms of criticism of scripture and then applies that to the Gospels. Wenham’s volume in the “Jesus Library” groups the parables around various themes putting like parables from across the Gospels together into similar groups. This allows you to study individual parables and/or study a parable in relation to similar parables. You will not find a more thorough book on the parables than this one. This goes into everything from parallel teachings of the Rabbis to other cultures, etc. You will probably find this book to be overkill but it will also give you information no one else provides. This book makes a lot of theological connections between major Old Testament themes and the Synoptics. This has proven very useful in my studies especially in regard to the theology of the synoptics through the lens of Judaism. Both Witherington and the next book by Bauckham go into great length about the women of the Gospels. Witherington starts off with a few chapters about women and culture in the first century and then goes into specific women. Bauckham starts off in the Old Testament to give the roots of the New Testament thinking on women in the gospels and then goes to specific women mentioned in the four gospels. This is a very practical study of Mark that highlights some of the more salient points for preachers and teachers. Craddock has always been known for his ability to illuminate the text in his preaching. He brings both his preaching ability and scholarship to the table for a fantastic combination that is sure to help anyone who is preaching , teaching or just studying through the Gospel of Luke. Thorough. 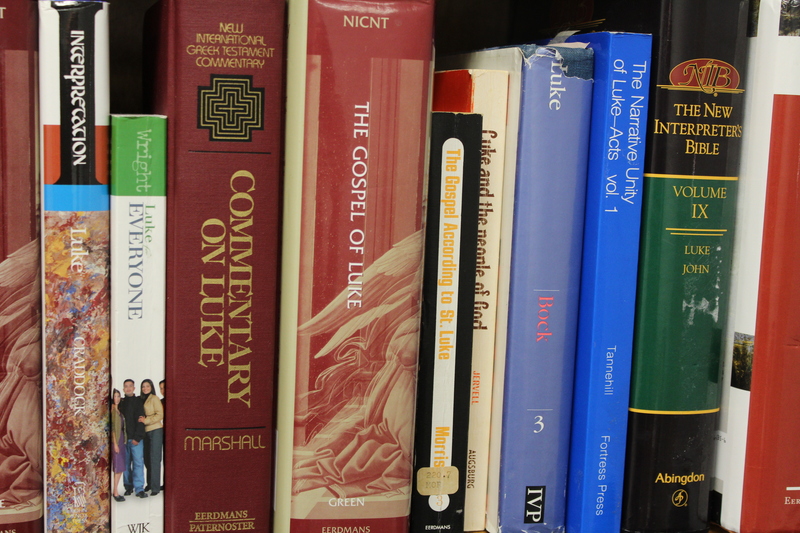 You will not find too many treatments of Luke more thorough than Green. Darrell Bock’s Baker commentary would be the exception. Green’s commentary is useful for a variety of skill levels although it is probably most helpful for those with more advanced Bible study skills. Highly technical commentary that requires a basic understanding of Koine Greek. Entry level commentary that gives you the broad strokes of the text. Each of Wright’s “For Everyone” commentaries starts each section of text off with a personal story that is then used to illuminate the text. Very helpful for all skill/study levels for getting the main idea of the text.